This was likely our last cross-country trip. It was our seventh time to the East Coast, and we were looking to fill in some holes in our travel map as well as revisit some favorites. When are now selling our M380 coach. I'm not sure if Nikki has ever been swimming 3 days in a row before in her 7-1/2 years! 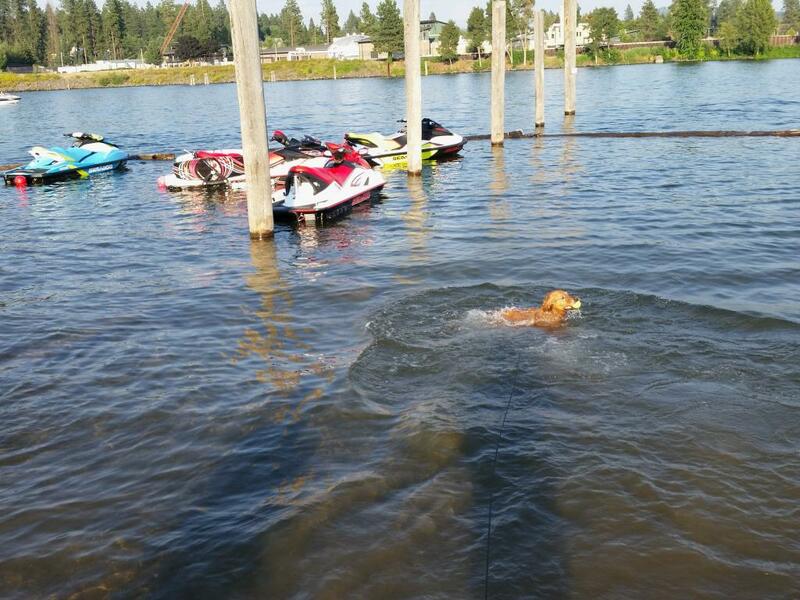 She got to swim twice in the Columbia at Pasco, and then again here at the head of Lake Coeur d'Alene. Likely get to go again tomorrow. We waited until temps got below 90 in the evening, for our comfort, not hers. We still swim her on a long line, or we would never get her out of the water. Not sure if she will ever calm down enough for that. 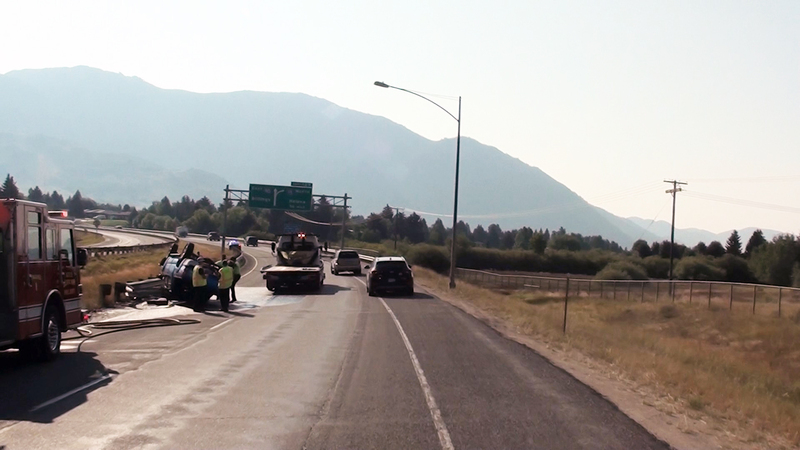 This was in Butte, I-90 westbound Read online that there were 4 inside, with only one injury (broken arm). Distracted driving blamed; the driver drifted left and couldn't correct before hitting the guard rail. The deer on the far right came bounding up the bank and I was sure that either I was going to hit it, or it was going to hit me. Hit the brakes, but I couldn't slow much at all. Could be that the sound of my Jake-Brake startled it; anyway it stopped right at the pavement edge. Out of vision for the dashcam at that point. 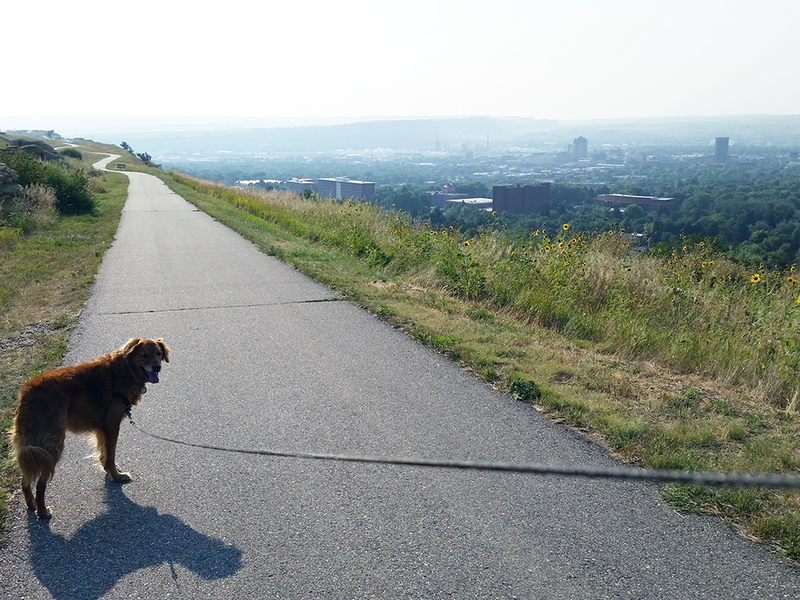 There is a very nice bike and walking path up on the bluffs above Billings, and we went out early this morning before it could heat up. Supposed to be 104 today (Saturday, Aug 11). The smoke isn't as bad as the picture makes it appear. 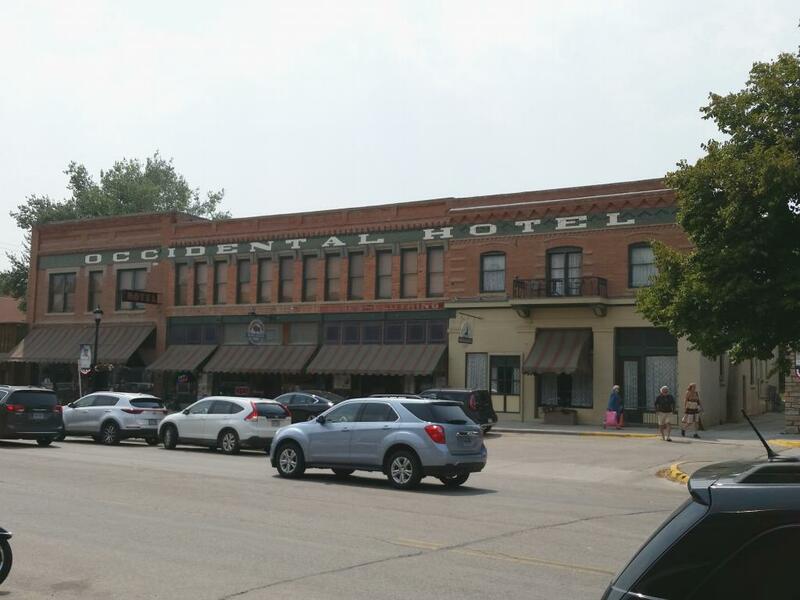 On the left is the historic Occidental Hotel in Buffalo, WY. 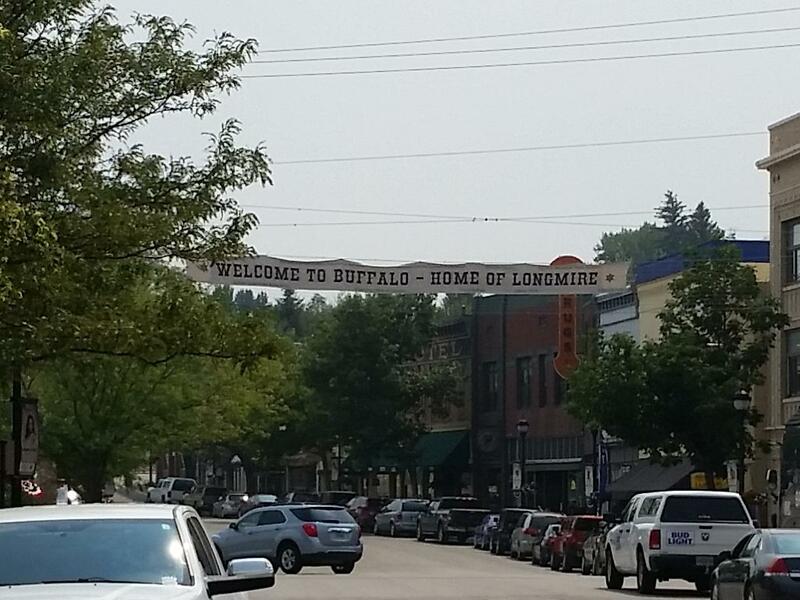 We arrived on the last day of an annual event - Longmire Days. Having never read the books or watched the shows I knew nothing about Longmire, but I gather it is/was a Netflix show and before that A&E. The author is a Buffalo citizen, and some of the actors show up and they have a weekend of various events. Good thing we didn't try to get a reservation before Sunday, as it would have been impossible! 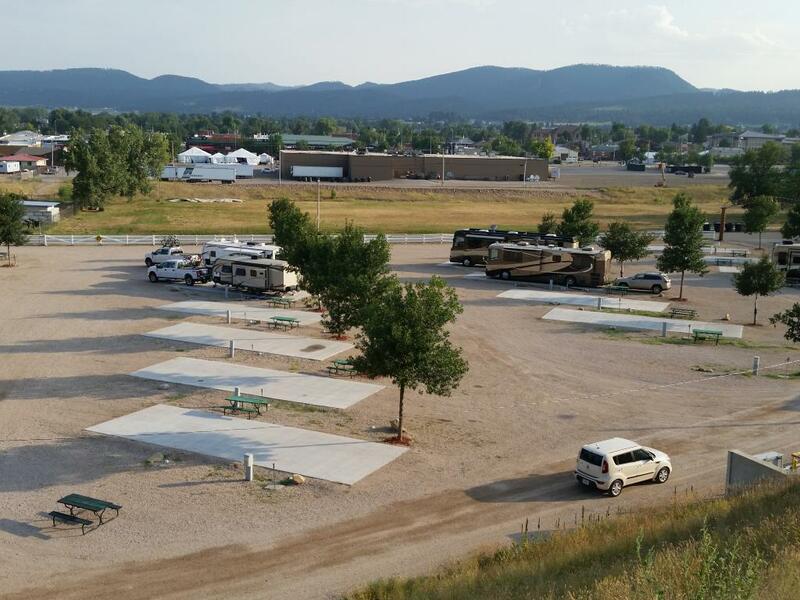 Here we are in Sturgis. Last week this would have been wall-to-wall motorcycles, this week pretty dead. Up to this point we have been in places we've been to many times. 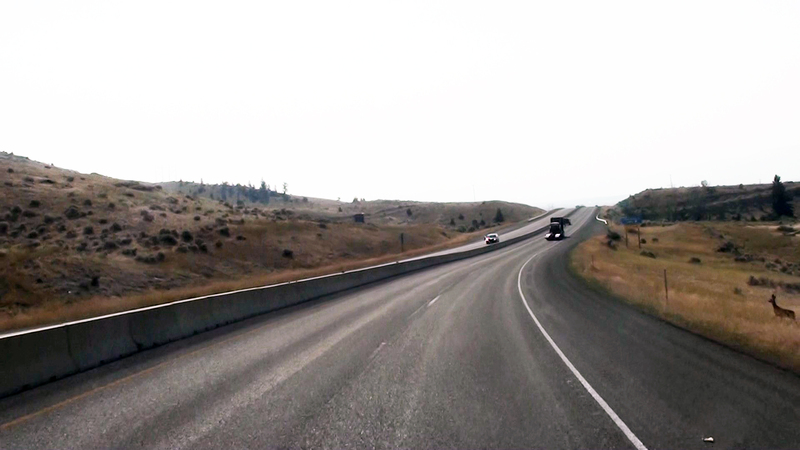 Sturgis marks the beginning of mostly new places for the next couple of thousand miles. Here are a few pictures from Deadwood. 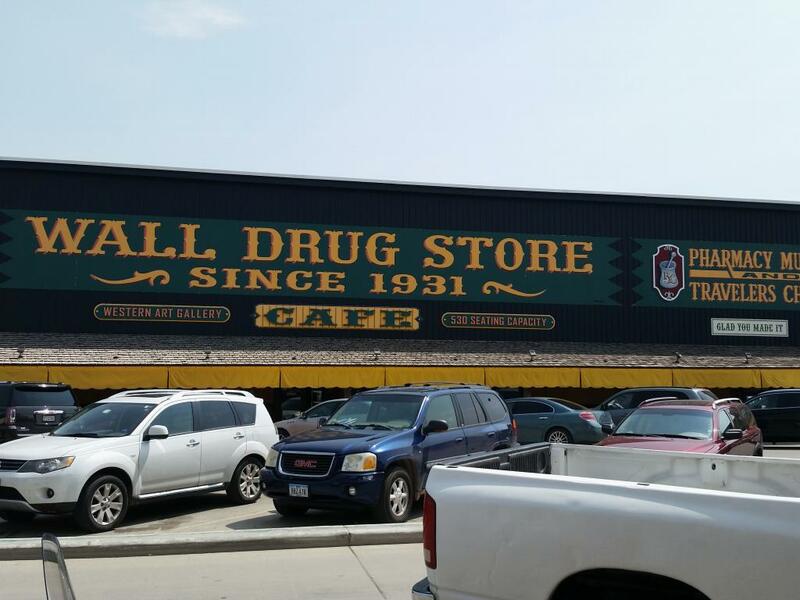 We drove and walked around Sturgis today, and here's a bit of the "flavor" of this town. Sitting in the middle of the Missouri River at an Army Corps of Engineers campground. 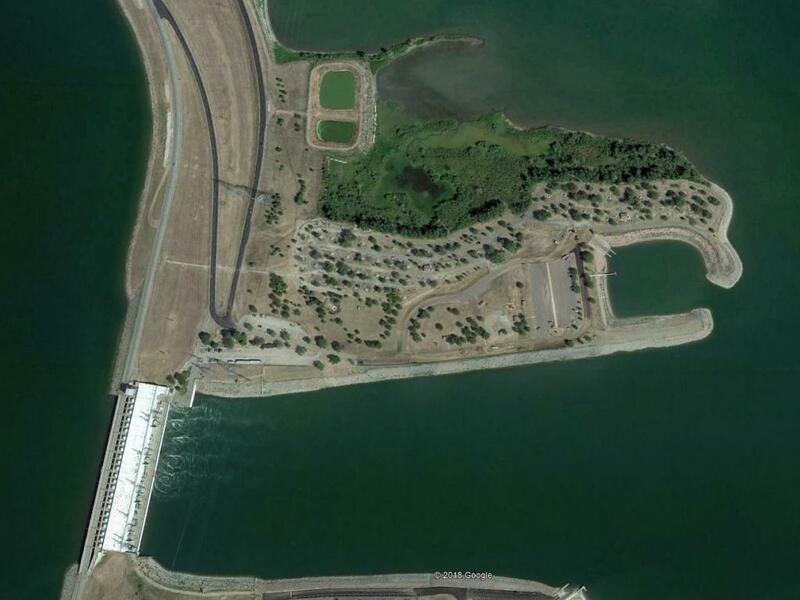 These Corps-run campgrounds have 50-amp power, but usually no water or sewer hookups. $18 per night, but $9 half-price with senior passes. This is at Big Bend Dam, which forms Lake Sharpe. This is the South Dakota state capitol at Pierre, which I just learned a couple of days before we got here is pronounced Peer. A lifetime of pronouncing it wrong when reciting the state capitals. Kansas City has a nickname "City of Fountains" and there are a lot of them, both mundane and spectacular. Here is a small sample of their water features. "The Zou" at Mizzou in Columbia. Views of some of the iconic St Louis landmarks. While visiting the spot for taking pictures of the Arch from across the river we noticed a sign about being on webcam, so made a couple of calls to Arcata Pet and Joy's sister Carol sp we could wave to them. After we were back at the RV I captured a small amount of the video when we first arrived. Nikki greets everyone like a long-lost cousin, including people who've been dead since 2004 like this guy! The statehouse in Columbus Ohio was not very impressive, so I took this photo of a building across the street. We thought it looked like an old church, but have since learned it is the old, old post office, now law offices. Millersburg, Ohio. The only place we have seen a hitching rail at a Wal-Mart Supercenter! Leaving Berlin, Ohio in the rain. Ashtabula, Ohio in the rain. These two classics were at the RV park we stayed at on Grand Island. If I'm not mistaken they are a 56 Crown Vic and a 67 Stingray. Nikki got to swim for almost as long as she wanted at Seneca Lake. This is an old church in Geneva, NY at the north end of Seneca Lake. Crossing a narrow bridge in southern Pennsylvania I thought I could squeeze between a large 5th-wheel trailer and the guard rail. Didn't quite make it. On Chincoteague Island I was very surprised to get satellite TV through these trees. On the right is a view of the Assateague Lighthouse from our campsite on Chincoteague. 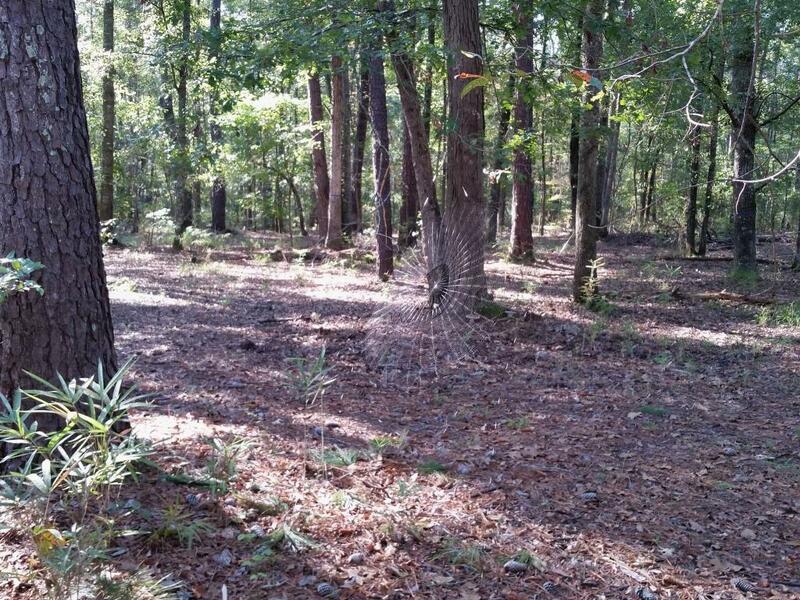 In the woods near a campground in southern South Carolina. We were supposed to visit a friend in Bainbridge Georgia, but decided to stay further inland because Hurricane Michael was coming. They got hit hard, losing most of their roof and getting everything soaked. As a result we were the first of 150 RVs to arrive in Pine Mountain, Georgia, for the Wanderlodge Owners Group Rally. 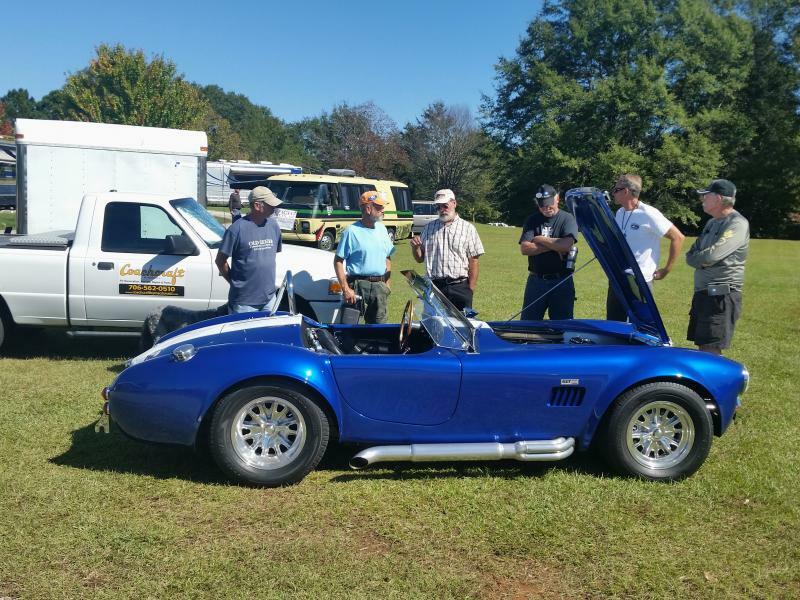 The rally is a week of friends and food, not to mention toys that people bring. We got our coach washed and wheels polished, but of course that only lasts until the next travel day that includes a storm! An auction is always held on the last night of the rally, to raise funds to pay for the rally. Headed home, we stayed a few days with friends in Austin, where there has been a lot of water flowing into Lake Travis below their home. 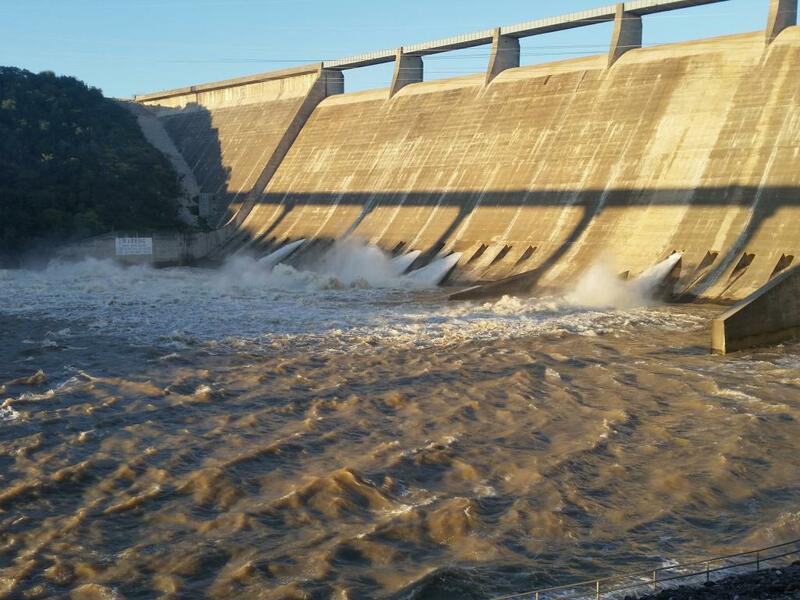 They don't usually get water releases like this from the dam. 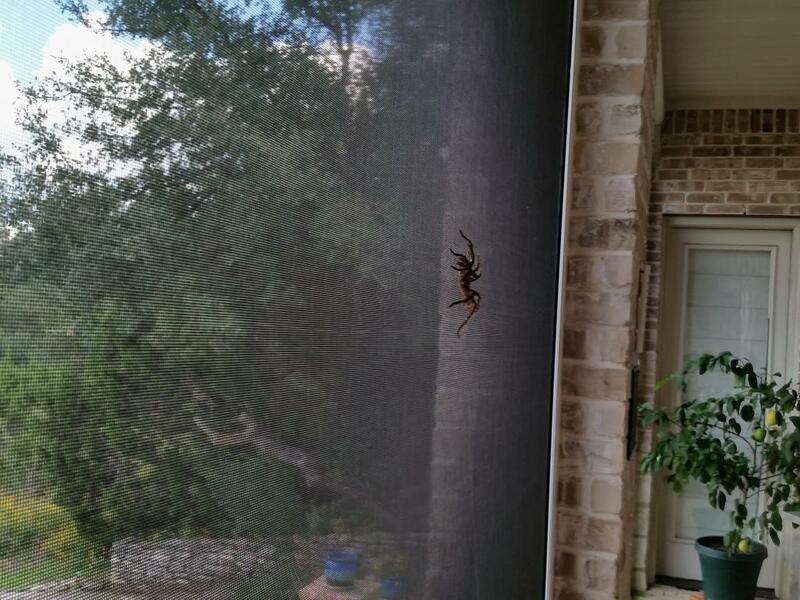 Below right is a visitor as we were sitting down to dinner one day. Heading across Texas I hit a piece of metal on a state highway just south of Johnson City. 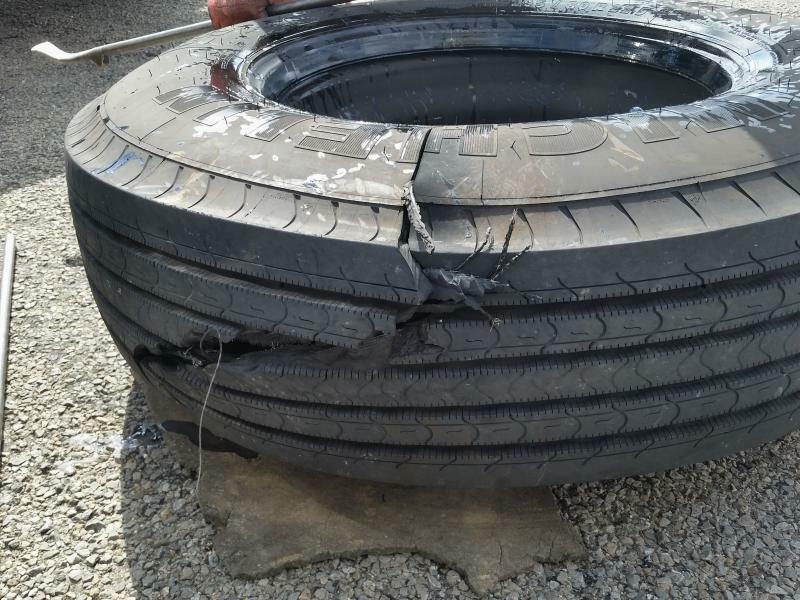 Ruined a perfectly good tire.